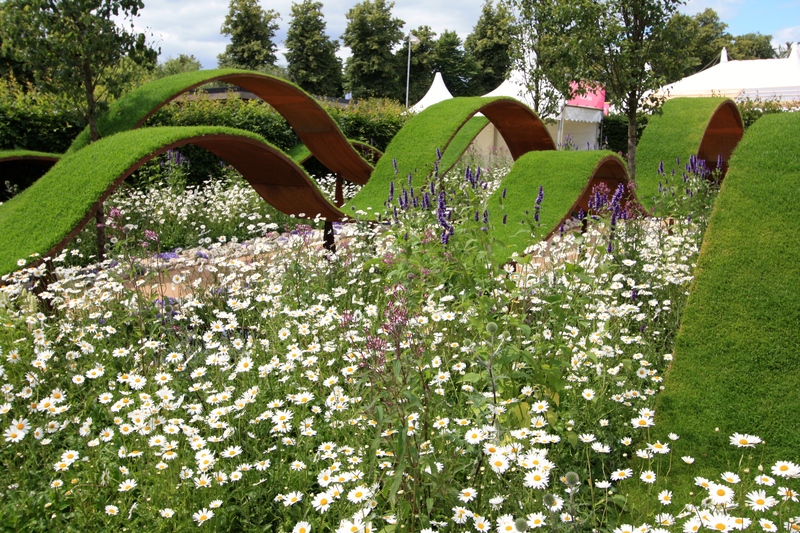 Designer John Warland has been a constant and stimulating presence at the RHS Hampton Court Palace Flower Show in recent years. 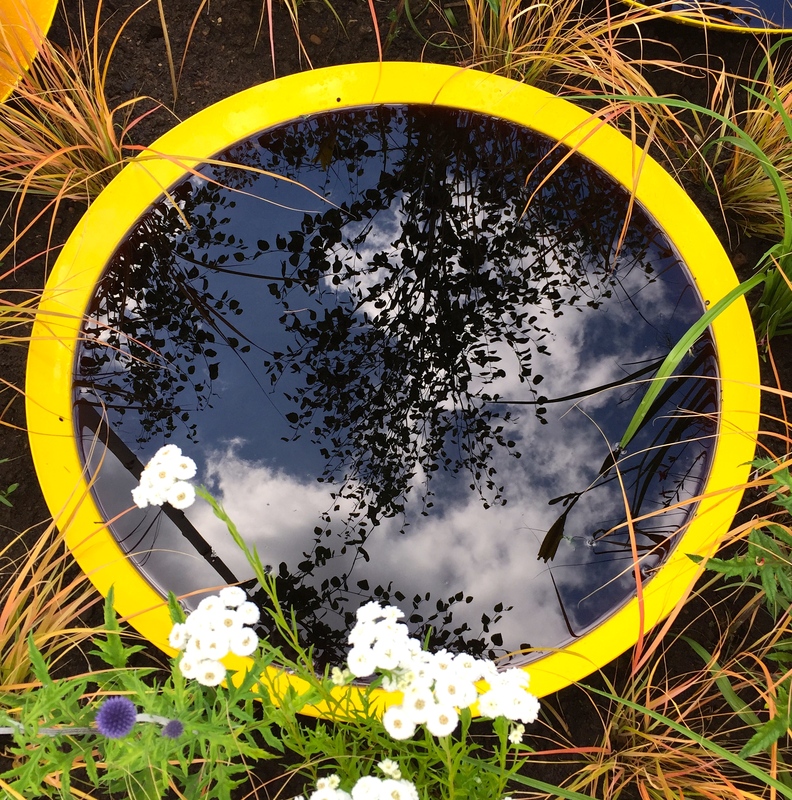 His gardens for children’s charity World Vision have been amongst my favourites, blurring the boundaries between landscape design and art, whilst at the same time conjuring up beautiful, playful, often dazzlingly bright spaces. There has not been a John Warland garden I have not enjoyed, and this year was no exception. 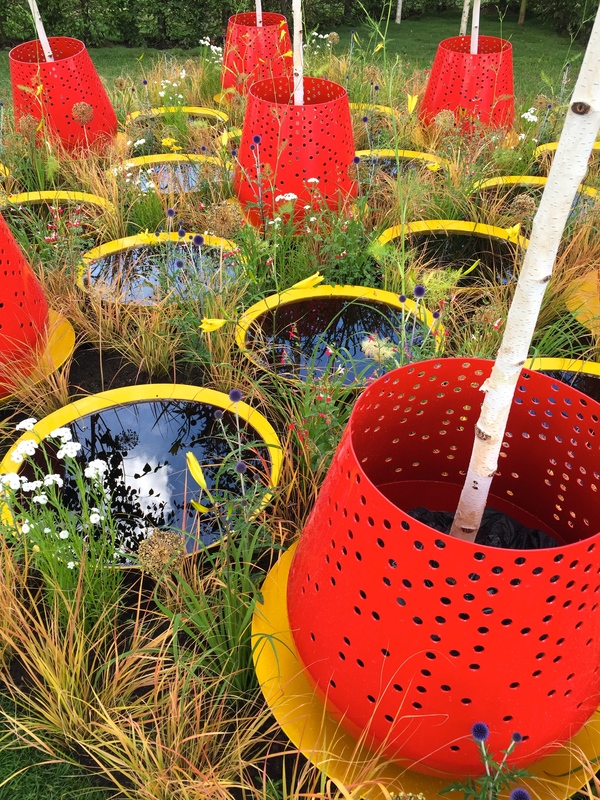 Backed by a different sponsor, Paneltech, the talented designer was able to explore new territory at this year’s show with a garden entitled Kinetica. Inspired by particle theory, the square, symmetrical layout of Kinetica represents the molecular structure of a solid object. 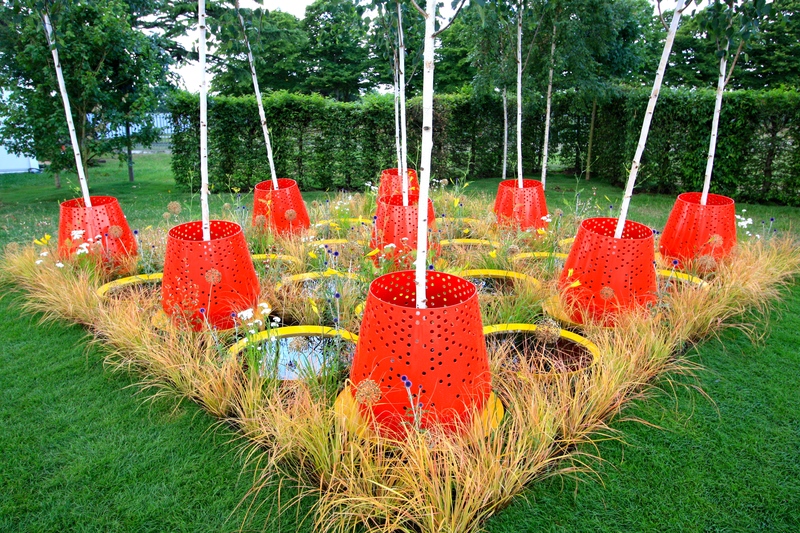 Nine, perforated, red planters, each sheltering a specimen of Betula jacquemontii, are weighted underground using pendulums to maintain them, and the trees, in constant motion. The perpetual swaying is intended to displace pollen into one of sixteen canary-yellow basins filled with dark, reflective water. Here Brownian Motion takes hold, moving the tiny particles randomly across the calm surface. The message? That in an increasingly unstable world, with movement and change all around, only one’s individual perspective can determine the concept of stability. The planting, which might have been nothing more than cheerful window dressing, supported the scientific concept with the inclusion of Clarkia pulchella, the plant which assisted Robert Brown in his discovery of Brownian motion. Using a microscope, the botanist studied the movement of the flowers’ oblong pollen particles in water, observing their apparently random and erratic progress. This movement, it was eventually concluded, was caused by constant bombardment from particles in the surrounding medium. Other plants used include Echinops ritro (globe thistle), Salvia ‘Hot Lips’, Anemanthele lessoniana (pheasant’s tail grass), alliums, Achillea ptarmica, Foeniculum vulgare (fennel) and yellow hemerocallis (daylily). In a world where we are all bombarded and moved, not always willingly, by bad news, fake news and omnipresent social media, this is a garden we should all be able to relate to. I gazed upon it and felt calm and settled, but at the same time enlivened and amused. Others may feel puzzled, unsettled or even repelled by its quirkiness. And that is exactly the point the designer wished to make, that stability is in the mind of the beholder. TFG. Whoa! 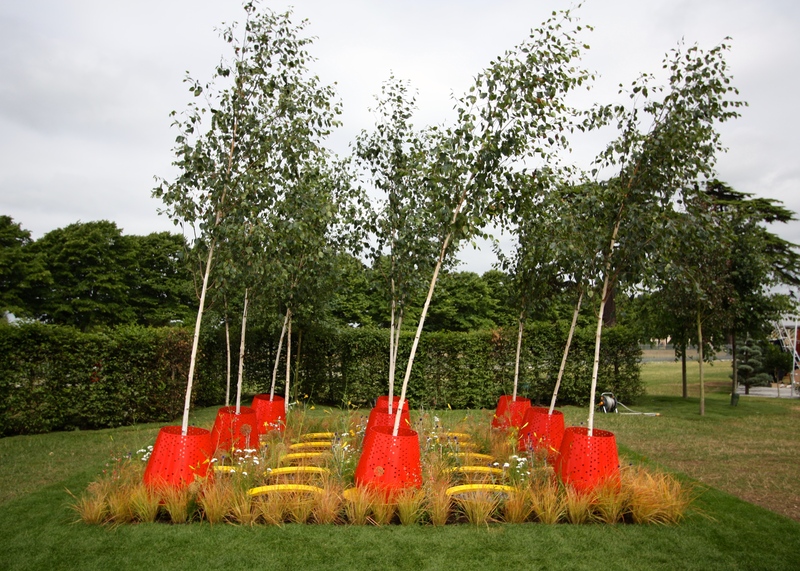 Not necessarily my cup of tea planting or colour wise, but I love the concept and I especially love the birches in those pendulum pots – what a clever idea. Most interesting post Dan… thanks so much for sharing. I have some gardens to write about that you will like much better Helen, but lawns were seriously lacking …. again. You could shove a few eucalyptus trees in waste paper baskets and be the talk of Hurstbridge. No? Thanks for the stimulating post. Really enjoyed it as I sit here in the rainforest of North Queensland trying to come up with a new creative idea for a more functional commercial garden design where achieving the tight budgetary constraints and complying with local government codes are the main objective. So interesting to see what the rest of the world is up to and it’s good to be reminded that a landscape can be more a work of art and a statement than a purely functional and attractive space. Wish I could find more clients who would let me be so inventive as this…. Hmmm, yes, that’s why I gave up being a Landscape Architect Suzan. The only time in my life I have given up on anything I’ve really wanted to do. But there were only so many car park schemes I could stomach! Then again, being creative is what we are trained to do, and hopefully conceptual gardens like this help to push the boundaries. John Warland’s work is definitely worth exploring further if you like this garden. Meanwhile, I now have an amusing and presumably quite wrong image of you sitting at a drawing board under a canopy of towering trees in the forest, with a puzzled look on your face. I think those clients need you – they just don’t know it yet! Thank you so much for all of your posts, but this one really got me, when you first posted pics I thought really “this you love”, but then you gave us the full story, all I can say is WOW to everything about the whole idea. Science, learning something new, conception, etc. etc. etc. That’s nice Sarah. I converted you! There is a place for conceptual gardens, and if I had all the space I needed for conventional gardening I would enjoy something like this in my own space. A simplified version might also work in a public area. I like to keep an open mind, thank you for doing so too.